You may feed me breakfast at 11 o’clock. But I will not be tricked. Come 1 o’clock, I need lunch. And I mean a proper lunch, preferably hot with all the food groups. Do not give me a cracker or a piece of fruit and call it lunch. You do not want to see the consequences of not feeding me lunch. Eight years ago, my mother and I were visiting relatives and family friends in Germany. We took the train from Osnabrück to Hamburg one July morning, riding for about 3 hours. I was hungry on the train and considered buying lunch there. But since lunch is like dinner in Germany, I do believe my mother convinced me not to. (Or perhaps I came up with the not-so-brilliant plan of starving all by myself.) We were due to arrive just after 1 o’clock, and we thought my mom’s cousin Kristina and her husband Klaus would feed us. Klaus and Kristina welcomed us warmly and took us out to a pretty, shaded table on the deck. As you might imagine, I was hungry and having rather overwhelming visions of lunch at that point. Kristina went inside to bring out the food, and we waited with anticipation. But what she returned with was not hot or hearty or even savoury. I took one look at that cake and felt tears pricking. Then I felt a sniffle. I just wanted lunch. I just wanted to die of embarrassment, crying in the middle of the day at a perfectly nice cake brought out by relatives I had only met once before. My dear mother went inside to explain in German and came back with a yogurt for me. I brushed away my tears and prayed my red nose would calm down sooner rather than later. Finally, my yogurt eaten, we all tried the cake. 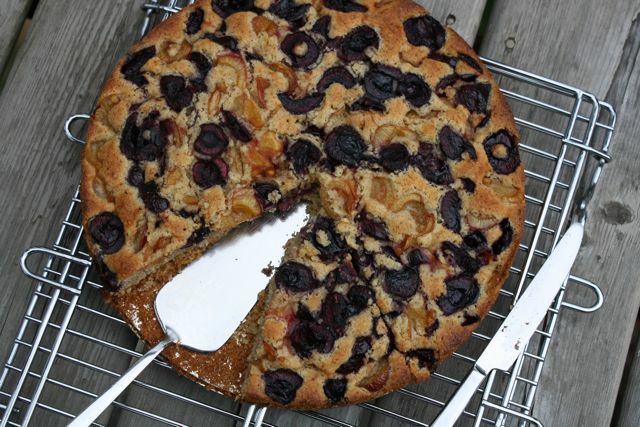 It was, in fact, a perfect summer afternoon cake: sour cherries on a tender cake that was so hazelnut-y I knew I had to be in Germany. Needless to say, I took a deep breath and asked for the recipe. I have been making it ever since – for dessert, not lunch – fumbling around, trying to adapt the European weight measurements into cups and teaspoons. 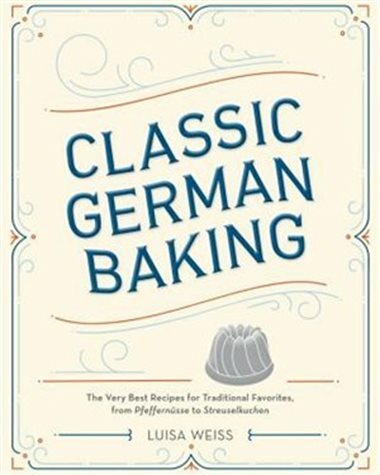 Even with my haphazard measuring guesses, it always baked up into a lovely cake and made me think of Hamburg. 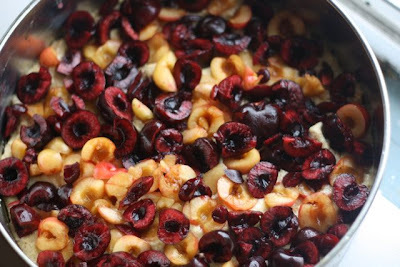 Since it’s July, I decided to use fresh cherries this time. Baked, they are not quite as pretty as the very red sour cherries, but with a dollop of cream, it’s a very delicious cake indeed. Feed me this any day – for dessert, not lunch. Preheat the oven to 360 degrees Fahrenheit (180 – 200 degrees Celcius). Butter a 9 or 10-inch springform pan. 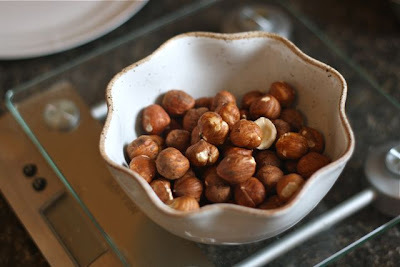 Grind the hazelnuts finely in a food processor. Try to stop before they become hazelnut butter. Set aside. Pit cherries if necessary. If using fresh, chop them roughly. Set aside. Cream butter and sugar together. Beat in the eggs and milk. Set aside. Mix the dry ingredients together – stir well. Stir into the creamed mixture. Scrape into the prepared pan. Place cherries over top to cover. Bake for 30 – 40 minutes, until golden brown and a cake tester comes out crumb-free. 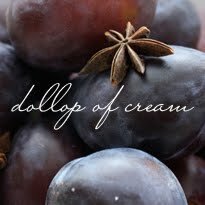 Once the cake has cooled, serve with a dollop of whipped cream. Do you think walnuts or almonds work work instead of hazelnuts? 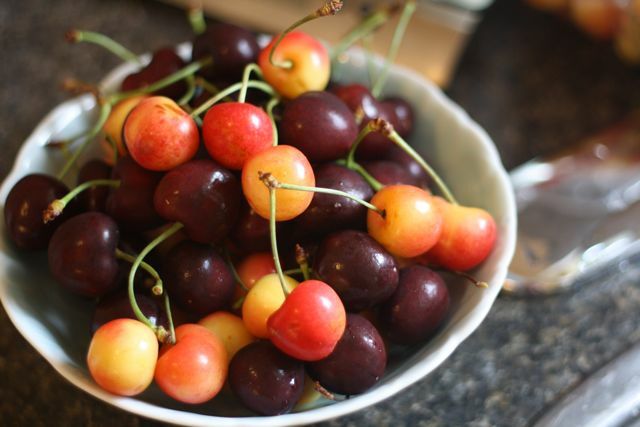 I have some fresh cherries I just picked yesterday - but no hazelnuts! Yes, I think either would be delicious. Why don't you try a mix and tell me how it works out? I had something like this when i went to Switzerland but with funny plums instead of cherries. Your blog is lovely, nice food and good chat. 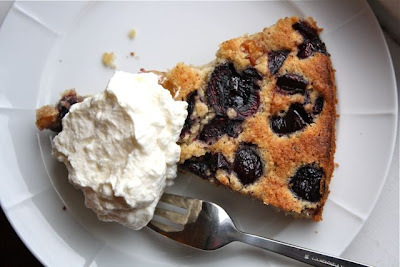 Ich liebe dieses Rezept, der Kuchen schmeckt einfach wunderbar.